CTRL + Context add effect Invokes Add Multiple function. Works only with Add Effect in context menu. CTRL + Right Arrow Move selected effect right. CTRL + Left Arrow Move selected effect left. (SHIFT) + S Same as Align element start time in context menu. Key by itself moves start time, adding SHIFT holds duration. Mouse pointer over selected element to use for align to. (SHIFT) + E Same as Align element end time in context menu. Key by itself moves start time, adding SHIFT holds duration. Mouse pointer over selected element to use for align to. B Same as Align element start and end time in context menu. Mouse pointer over selected element to use for align to. CTRL + SHIFT + S Align the beginning of the selected effects to the closest Mark. 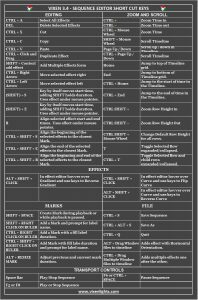 CTRL + SHIFT + E Align the end of the selected effects to the closest Mark. CTRL + SHIFT + B Align the beginning and end of the selected effects to the closest Mark. SHIFT + SPACE Create Mark. The Mark is created for the current cursor time. It is added to the currently selected Mark Collection. This function only works while the sequence is playing. 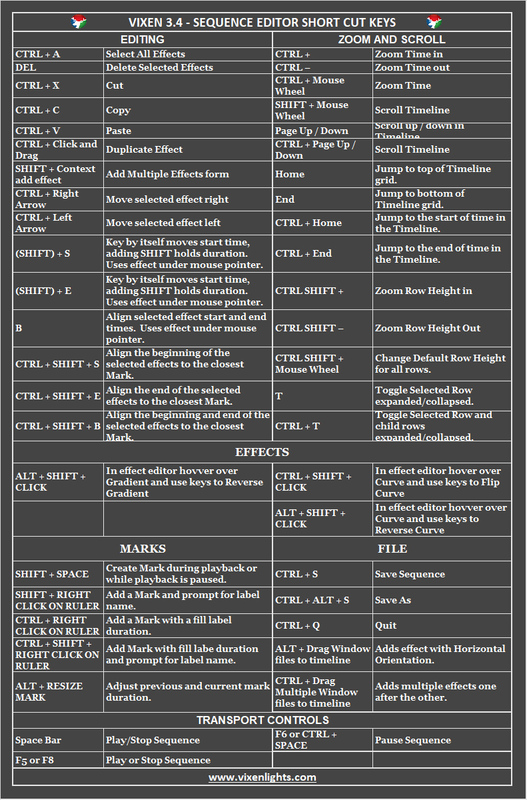 Click on the Shortcut Key card below to enlarge or right click and Save target. Recommend printing and attaching to the side of your monitor. Click here for a demo on the use of Short cuts.